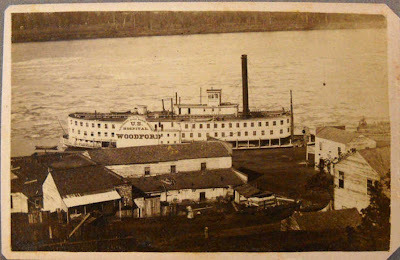 Steamboat Arabia: A Historian’s Blog: What if the Steamboat Arabia didn't hit the snag in 1856? What if the Steamboat Arabia didn't hit the snag in 1856? Hello and Welcome to my blog. Since so many Civil War Reinactors visit the Arabia Steamboat Museum, I questioned: What if the Steamboat Arabia didn't hit the snag in 1856; what would have her life have been? It's a game or scholarly curiosity Civil Round Tables play. They ask questions....what if this & what if that...So, this blog goes out to the Civil War Round table of the District of Columbia who will be visiting Vicksburg in April 2013. "If Steamboat Arabia was docked in St. Louis during the Union occupation, what might happen?" I'd love to be a fly on the wall to hear that conversation. 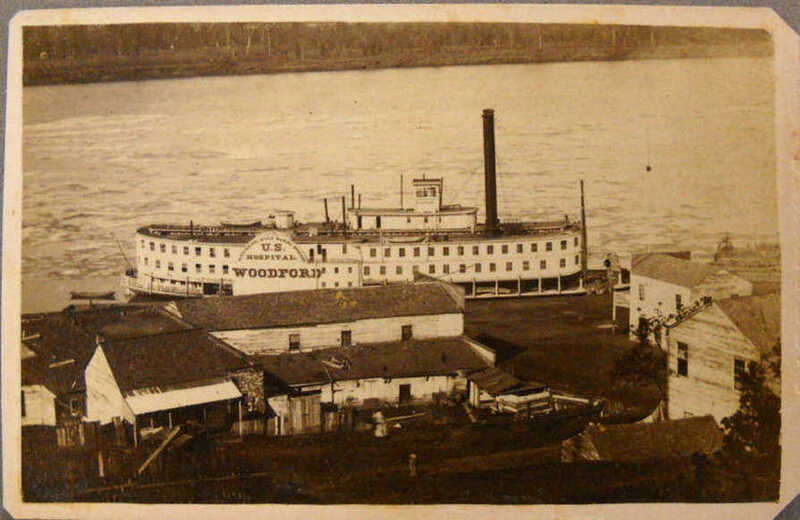 When the steamer sank she was last owned by two forwarding and receiving commission merchants who remained in St. Louis, and, like all merchants, their shipping business catered to the U.S. military (sending similar goods found in the Arabia Steamboat Museum). This chart says it all and is a newly acquired pamphlet in my collection titled: REPORTS to the WAR DEPARTMENT by BREV. 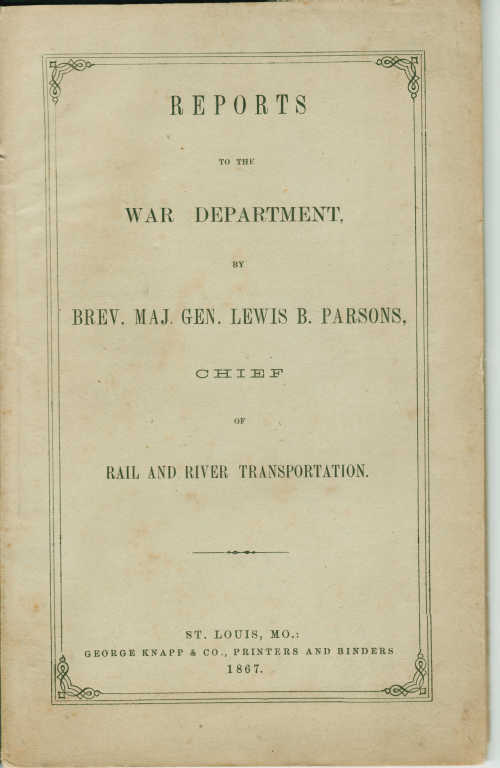 MAJ GEN. LEWIS B. PARSONS, CHIEF of RAIL AND RIVER TRANSPORTATION. St. Louis, Mo. George Knapp & Co., Printers and Binders 1867. And read; "The amount of transportation furnished at St. Louis, Mo. 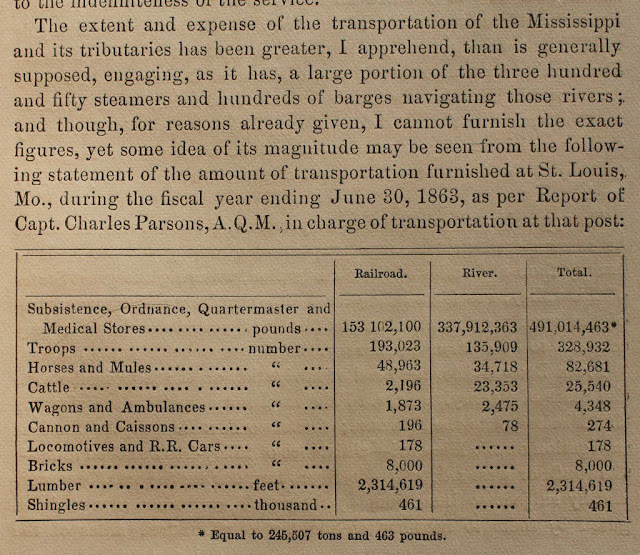 during the fiscal year ending June 30, 1863, as per Report of Capt. Charles Parsons, A. Q. M. in charge of transportation at that post." The chart shows a comparison between trains and steamboats and steamboats transported more provisions and a third less troops than trains. My own Great-grand father John Westly Duncan rode the side wheeler Sam Gaty north after the Battle of Shiloh. (April 6-7 1862). On his Iowa's unit trip back down the river, he had seen enough and was listed as AWOL in St. Louis. Thank heavens he did because many in his unit died from smallpox shortly after and I wouldn't be here. (This reports listed the Sam Gaty was lost to a snag in September 1863 at Island No. 62 near Vicksburg). What would Steamboat Arabia's role had been (if she hasn't sunk) during the Civil War? Which side would she be on- Union or Confederate? Would she be transporting government troops, be a hospital or still in private hands? Would she be burned to avoid being captured, sunk by enemy fire, commandeered by officers or would have survived the war? I'd approach this, "What if," by finding a good source and I found one. Above- In Memoriam- General Lewis Baldwin Parsons (he oversaw the western transportation in St. Louis during the Civil War.) His memoriam gives many details about St. Louis during the Civil War. Google Books has a copy on line (click on the cited book above & scroll up to page 1). Parsons had an interesting life, he lived near St. Louis where he was a lawyer and married there. It is such a good pamphlet and when I read down the List of Boats Destroyed on the Mississippi River and its' Tributaries, I saw many steamboats that plyed the inland waterways with the Steamboat Arabia. Grey Eagle- May 9, 1861- Where: Rock Island Illinois- Collision with a bridge- Value $35,000- owned Galena, Ill.
Imperial, Hiawatha, Post Boy, Jesse K Bell- September 14, 1863- Where: St. Louis Levee- These boats were burned by Frazier and his accomplices, acting under instructions from rebel government. In conclusion, I think Steamboat Arabia would have burned by the rebels. With that in mind, isn't it nice she hit the sang and sank so the merchandise ended up being artifacts in the Arabia Steamboat Museum. My next blog will post the List of Boats Destroyed on the Mississippi River and its' Tributaries from Capt. 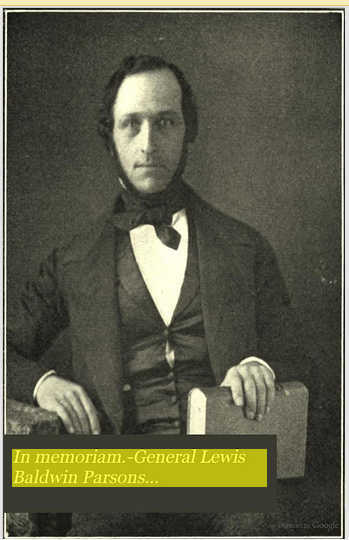 Charles Parsons, A. Q. M. Report. I had to be extra gentle with this because I didn't want to break the spine. Chances are that the ARABIA would never have made it to the Civil War years since most boats in operation on the Missouri River at that time had a life expectancy of 3 years or less! Many didn't last nearly that long. Also, many of the boats that were owned or commanded by Southern sympathizers were taken to rivers in the south to avoid them being confiscated or conscripted for use by the Union. After Union troops took control of Missouri's government and martial law was declared in Missouri, ALL persons associated with ANY boat in operation on the Missouri river were required to take the "oath of loyalty" in order for the boat to continue working on the river.